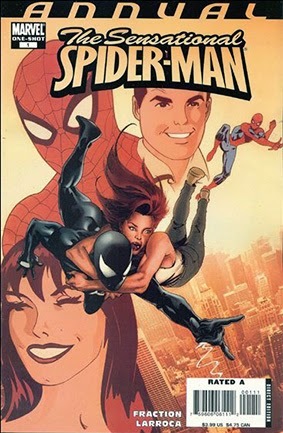 • PLOT SUMMARY: A long-lost suitor from Mary Jane’s past presents her with a shocking offer: she can walk away from the torment and tragedy of life on the run…and all she has to do is turn in Spider-Man. Given the choice between a fugitive’s life and the fame and fortune she left behind to marry Peter Parker, will she take the deal? Meanwhile, across town, Peter Parker brokers the safety of his wife and Aunt May…even at the cost of his freedom. How much madness and loss can one marriage take? Join us in this retrospective of one of the most enduring love stories in comics. Cover art by Salvador Larocca.